Saucony has made a strong entry into the lightweight, flattish soled running shoe category with its recent release of the Saucony ProGrid Kinvara. I haven’t worn the Kinvara myself, but word from some friends is that it’s a very nice shoe – lightweight, and well built for midfoot/forefoot runners (you can read a Kinvara review by my buddies Thomas and Steve over on the dailymile Community Blog). 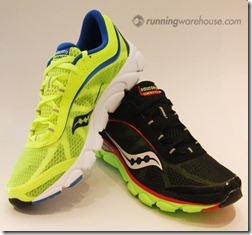 Somewhat lost in the heavy marketing being put into the Kinvara’s release was the recent release of another shoe by Saucony that might appeal even more to minimalist runners – the Saucony Grid Type A4 racing flat. A reader just sent me an e-mail (thanks Todd!) indicating that he tried out the Grid Type A4 and thinks very highly of it as a midfoot/forefoot striking shoe. For Saucony fans concerned about the overall sole height of the Kinvara (assuming there are people besides me who actually pay attention to things like this! ), the Grid Type A4 might just be the shoe for you. The A4 is not only lighter than the Kinvara (it weighs in at 6.3oz vs. the Kinvara’s 7.7oz – both values for men’s size 9), but it’s sole sits closer to the ground (13mm heel cushion, 9mm forefoot cushion in the A4 vs. 18mm/14mm in the Kinvara). With a heel-toe drop of only 4mm, the Grid Type A4 does seem like a promising candidate for midfoot/forefoot striking runners. One of the unique and interesting features of the A4 is the fact that it has a drainage system built into the sole – if you look at the picture below, you can see the oval-shaped holes circling the inner portion of the sole. I can think of several races in my recent past where these would have come in very handy. Sole of the Saucony Grid Type A4 – Note the drainage holes. 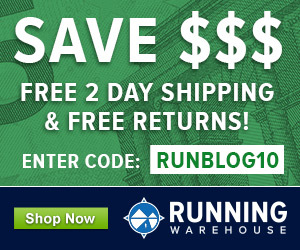 Don’t know much else about this shoe (other than that it seems overpriced for a flat at an MSRP of $95.00 – Update: thanks to Lisa in the comments for pointing out that it’s selling for $79.95 at Running Warehouse), but it looks like it has the potential to be another strong offering from Saucony – if you’ve tried it and have thoughts, feel free to leave a comment. Update 6/7/10: Below are some initial thoughts that a reader, Todd L., sent to me regarding his experience with the Grid Type A4. Hard to know if this is idiosyncratic to his gait (appears to be a forefoot striking wear pattern), but thought I’d share for your information. Do you also consider shoes like the adidas adizero adios to be minimalist – they’re closed to these Saucony in terms of design ? I’ve been running with the adios for a while but they can’t compare to Vibram FF or EVO as minimalist shoes. some “minimalist” shoes are far more minimal than others (e.g., Vibrams). shoes, and they are very popular with many of the elite runners. I’m referring to the adizero adios which are used – allegedly – by Hailé Gebreselaisie. I think you would consider them as minimalist since they’re race dedicated. read good things about it. The Adios has an 11mm heel to toe drop so should not be considered minimalist. I used to train in a pair of Adizero RC (6mm drop) and put over a thousand miles on them. Not sure which model Haile ran in before the Adios, but most of the Adizeros had lower drops than the Adios. He may have set the record in the Adios, but he has been battling injuries sine. Wow! Thanks Pete! I just got up early, excited to go for a run in my new Saucony A4’s (before it rains), decided to check out your site while having a quick cup of coffee and was greeted by this article. Very cool!! Will definitely post some feedback as I log more miles in them. allow me to buy every pair of shoes on the market! Thanks for the tip about the A4’s! Whats really funny is this sort of racing flat could be found in the ‘bargain bin’ of my local running store at a nock down price not long ago! only the lightest and fastest runners would buy them and they sold very slowly. Now i can see all the shoes companies jumping on the band wagon and ripping everyone off yet again!!! least we can still fall back on reasonably priced XC flats….for now. Thanks for this post! I just ordered a pair of these from running warehouse just a week ago for $79.95, and with the runblogger discount I paid $71.95 total. They just shipped yesterday and I should get them next week. 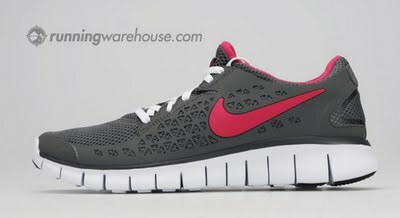 I have been running in the new Nike Free Run+ and love them. Not sure if I will keep the Sauconys or just order another pair of the Nikes. about here, but sometimes I have to rely on feedback from readers! 1) They feel great with a short-striding barefoot-running type of midfoot strike. 2) They are nice and light and breath really well. 3) They have a ton of grip with all those nubs on the forefoot. 1) I don’t get the feeling these will last very long. 2) The “drainage holes” plug up with small stones – and if you have sensitive feet you’ll feel them in there. This will also probably contribute to increased wear (decreased longevity) of the shoe. Note: this is with average road running (no off-road excursions). 3) As Rick intimated, even with Running Warehouse’s awesome prices, they’re probably still overpriced. 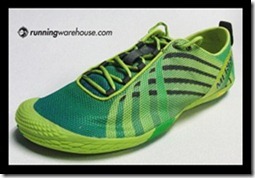 These probably shouldn’t be an everyday shoe for the minimalist runner… it’s probably better suited to race duty only. 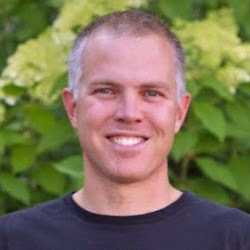 Thanks for a great website Pete! Don’t know if you’ve heard this from others, but I had huge durability issues with this shoe. I have loved Saucony’s A series, but I think they made a big mistake on the outsole of the A4. Granted, my footstrike is not perfect, but I don’t think it’s atrocious. I land on the outsides of my foot and roll inward, as I think most people do. After 65 miles I had ripped the triangle outsole pieces on the outside of the midfoot off, and by 80 miles was running on pure midsole foam. I know these are flats, but I expected more than 80 miles out of them. I’d like to see what the heel looks like on the photo above. I’ve also been a bit disappointed with the outsole material on a pair of fastwitch 4s. My forefoot is almost gone and the heel looks new. I’m not sure the distance that I put on them but I rotate shoes and they lasted significantly less time than others. I’ve worn Saucony’s A2s as well, which I didn’t consider to be particularly long lasting, but given price/weight/comfort I’d have bought them again. I am/was thinking about these shoes but I might avoid them. Thanks for the info on the website. I bought these shoes (type a4) approximately a month ago. I wear them for all of my speed work and wore them in a race this past weekend. After approximately 75 miles, my soles look almost like the day that I bought them. I do notice a few rocks in the drain holes, but they don’t appear to be damaging the shoe. Time will tell how many actual miles they last. I would consider myself an efficient runner, but I also weigh 175 pounds. I do feel the rocks when I run, but I think that is the point of the minimalist shoe. I’d recommend this to anyone. I also bought the Kinvara for my recovery runs, easy runs, and long runs. These two shoes provide everything that I need in running shoes. I love the Grid Type A4 shoes. These have become my favorite running shoe, and in my opinion, a nearly perfect running shoe. I have over 400 miles on these and have not had any of the tread issues that others seem to have. These have lasted me much longer than any other shoe, and still have lots of life left to them. I weigh 180 pounds, run about 40 miles a week, with the long run averaging 10 miles. I don’t have the best running form, and am mostly a mid-foot striker. the soles of my shoes – I sed to destroy the heels before my change. Just purchased the Grid Type A4 shoes; along with my wife. In May 2010 we decided to transition from our typical running shoes into minimalist footwear. We both purchased Vibram five fingers and have had huge success. Both of us have gained stronger legs and have evolved into more efficient runners. My knee pain post-runs have diminished completely! However; after completing a recent run in Sub-20 degree weather (Frozen Feet) we decided it was time to evaluate a minimalist shoe for winter and trail races. We have one run under our belt in the A4’s and both have appreciate the relative similarity to running in Vibram’s. Hopefully; the A4’s will be as durable as the Vibram’s have been. Good Luck. Trail Glove – liking both a lot! I have over 80 miles on my Grid Type A4s and very little wear. I have been enjoying them in the winter months as my alternate to my vibrams. My only complaint is when I come inside with snow packed in the sole, it melts and reverses up into the shoe and soaks my sock. I guess a small price to pay for minimalist running in MN! So far, on my minimalist journey, these shoes have the best feel for me and they hold up great. I don’t expect them to last forever since they are half the price of what I was paying for cushioned/support running shoes. What do you expect for the amount of abuse a runner puts on a $75 shoe? I just retired my first pair of A4 Grid’s after 300 hard miles of speed, tempo, and triathlon racing, with the triathlons including a number of miles on dirt and gravel. They held up exceptionally well, and my new pair just arrived from Runner’s Warehouse. I found the shoes worked well for me all the way up to the half marathon distance. One big plus for triathletes – the shoes drain well – no slushing in your socks or bare feet – with the drain holes. The flip side is that if you have runs or races on gravel, small rocks can find their way into the drain holes and cause discomfort until removed (happened once during the 10k portion of a tri). Thanks for the input – looks like the A4 is about to be released a new bright yellow color! If you use Running Warehouse and the CP15 code (entered under team discounts), you can get this shoe for $55 right now…I did & can’t wait to give em a try! I’ve been a barefoot (Vibram) trail runner for over a year now but needed something a tad less minimalist for hard pavement street running, but which nonetheless gave me a similar Vibram feel. After trying on 5 or 6 other pairs, the A4 stood out from the crowd. The breathability is unmatched, with mesh in the uppers and perforated holes in the sole, heel, and toe box. Ridiculously cool shoe to run in ~ like someone turned on the AC ~ and I wear this shoe barefoot. Obviously, whoever designed this shoe designed it with a barefoot runner in mind, as the tongue tag is embossed flush with the fabric, the tongue itself has elastic bands on either side to move up and down with the foot, and two very cool hydro-pockets on either side of the heel at the achilles tendon make for a snugger fit (which is good b/c this shoe runs about half a size large). There are no stitching seams in the shoe whatsoever, so wearing it barefoot is easy, and at 6.5 ounces, you might as well be wearing clouds. Great shoe. Couldn’t be more pleased. Looking to get these for a Marathon. @46cb3b9281164d1f48b4871df9926d24:disqus any other references that these Grid A4’s run a half size large? I wouldn’t want to get a UK 7.5 if the UK 7 would fit better! they actually, in my opinion, fit small – go either normal training size, or plus one half. +1 or +1/2 would be the best fit. If you wear 7UK get 7.5UK or 8UK. Saucony made a GRID A4 lightweight trainer a long time ago. I bought a pair c. 1994. Apparently they’ve decided to use the name/model again.